Martha: The Center for the Study of Social Policy (CSSP) is a nonprofit designed to influence public policy that affects children and families, and to provide technical assistance to states and jurisdictions testing new ideas and policies in child welfare, early childhood education and community development. The Center is always looking to embed more authentic parent and youth voice in our work, and that’s a work in progress. We rely on strong voices through partners that are already organized to provide input. So with Rise it’s a natural partnership. The first project that CSSP did with Rise was to bring parent voice into a policy paper about the impact of the federal Adoption and Safe Families Act (ASFA) on families. Rise developed a paper on parents’ perspectives on ASFA, and a Rise writer Lynne Miller spoke on a panel in Washington, D.C., alongside top policymakers and practitioners in child welfare. Then, in 2009-10, CSSP was trying to gather parents and parent advocacy organizations around the country to do national advocacy work on child welfare. We envisioned developing a bill of rights for parents affected by the child welfare system. Rise’s publication, From Rights to Reality, came out of that. From Rights to Reality combines stories and recommendations for how to develop policies that parents consider effective. Steve: Two years ago CSSP started working with the Harvard Center on the Developing Child on a project to improve outcomes for babies involved in the child welfare system. We brought together 30 scientists and child welfare system leaders to talk about research and what science suggests would help babies in foster care. We wanted the group to hear from frontline caseworkers, foster parents and parents in the child welfare system about their experiences with infants. Rise put together a video of stories and images of parents who had their babies in foster care. It was brief but really very powerful and made a strong impression on people in the room. People who run child welfare systems don’t hear that perspective every day. Lisa: Now CSSP is partnering with Rise on our work to shed light on the unique needs of expectant and parenting youth in foster care and their children. We’re working with two jurisdictions—Sacramento County and NYC—to implement a multi-generational approach. We also launched a national peer-learning network. Since 2012, Rise has run a special project—My Story, My Life—to run writing workshops with young parents who grew up in foster care and share their perspectives through publications, public speaking and collaborations with policymakers. We sought out a partnership with Rise and it has been invaluable. 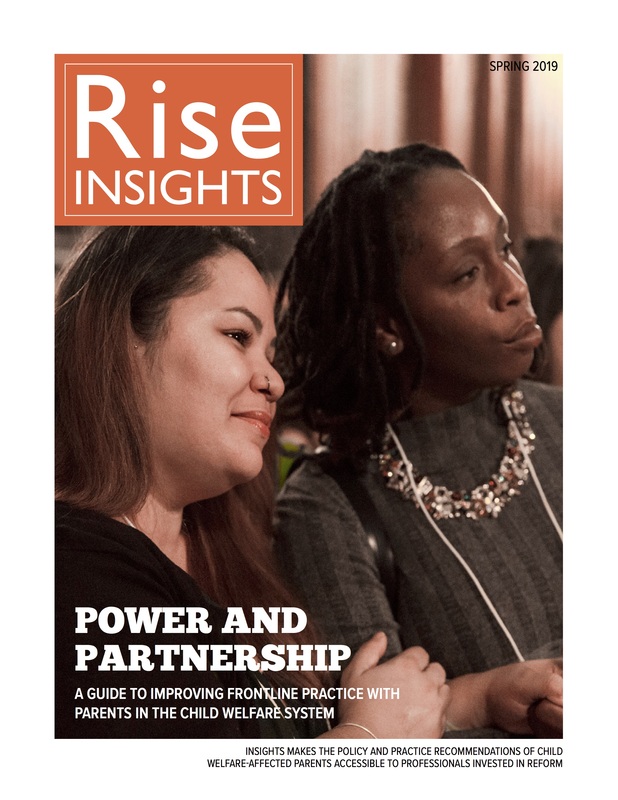 Through Rise, we’ve been able to obtain real-life stories of parents’ experiences and infuse them into policy briefs, training curricula and policy development. What we’ve heard over and over again is that these real-life examples help to ground the policy and practice recommendations. When staff gain a deeper understanding of both the strengths and the challenges that these young parents experience in their lives, it helps them improve their practice. Rise has done a lot of work with us. Last year, for a paper on the developmental needs of expectant and parenting youth, Rise facilitated a focus group with young parents to review the key content areas. Based on that feedback, we revised some of the content, and we were able to include some personal examples that made for a richer product. We also held a series of webinars and wanted to include youth voice in each one. We worked with Rise to identify young parents. We got a lot of feedback that hearing directly from a young parent makes a huge difference. It brings deeper understanding and insight, allowing staff to think differently about young parents and get new ideas for how they can engage and support the young people they’re working with. 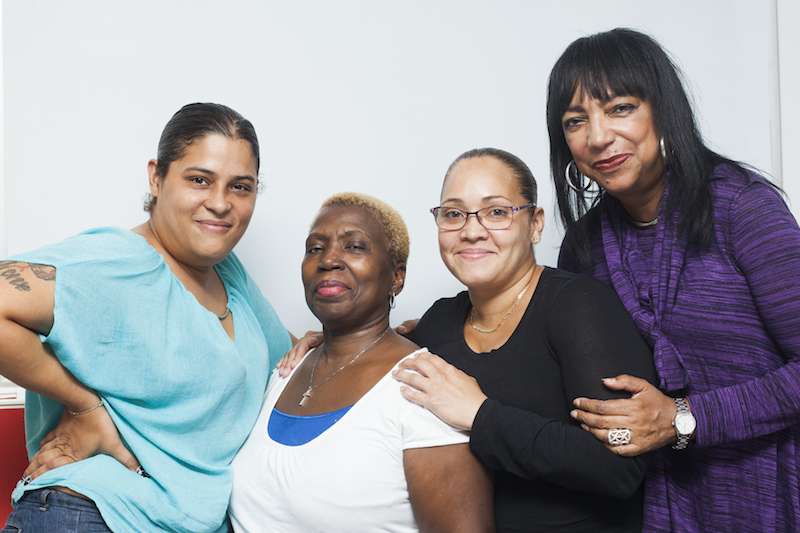 In New York City, the child welfare agency is also revamping its resource guide for expectant and parenting youth in care and Rise is providing real stories about how youth got their needs met, or didn’t, and what can help. Without the real-life examples, policy and practice resources can be very dry, and people might not pay close attention. The examples make it human and practical. Martha: I’ve been in plenty of situations where people say, “We need to talk to parents about how an aspect of the child welfare system is working.” Often, it’s pretty random who you encounter and how prepared they are to tell their stories. Because Rise has made investments in parents telling their stories over time, the parents are very prepared to tell their stories and to link their experiences very closely with a policy. They can provide feedback that is much more direct, helpful and focused than going out on your own. Steve: Rise is a good dose of reality. For people who have not been exposed to what parents have to say, I think that when they hear it once, it’s hard for them to not want to hear from parents again. Even judges and frontline caseworkers who obviously know lots and lots of parents can benefit from the Rise stories. They know parents in a specific way. It’s not the same thing as stepping back from a case you’re in the middle of and thinking about who these parents are. Steve Cohen is a Senior Fellow, Lisa Primus is a Senior Policy Analyst, and Martha Raimon is a Senior Associate at CSSP.